Robot 34/Plantimal 4: “The Living Machines Series/Surreal Evolution Series”. Medium: Graphite on paper (bright vellum). Original Drawing Size: 18” high by 24” wide. Framed size: 22” high by 28” long (side-to-side width) by 1” wide (depth of frame). Year of completion: 2016. Showings: 2017 Art of Planetary Science juried show held at the University of Arizona’s Lunar and Planetary Science Lab (LPL). 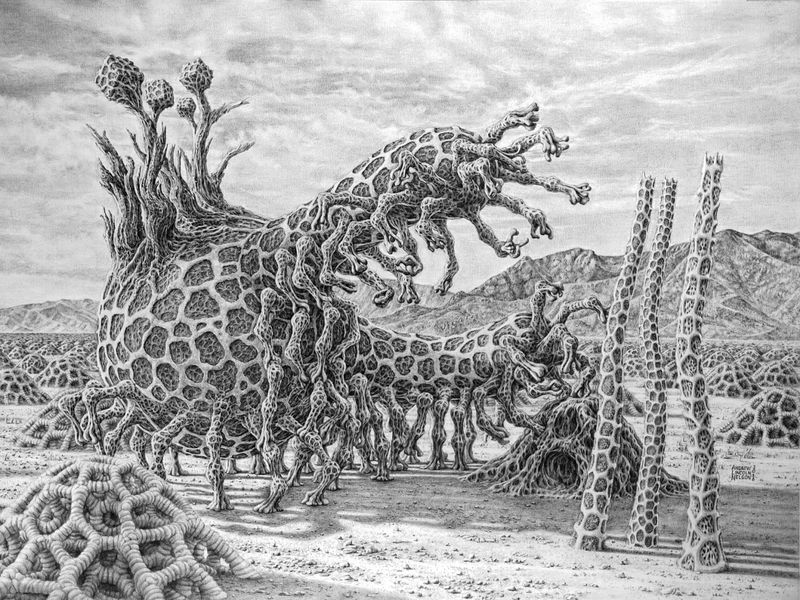 Description: This drawing explores astrobiology and exobiology from a somewhat surrealistic point of view. Life on other worlds or on Earth in the distant future may exploit different evolutionary and developmental strategies than those in evidence on Earth now. The central focus of the work, a large organic spheroid creature, is a mainly biological entity, but has cube-like trees growing on its back. These cubes may have had a distant technological origin, or might represent some kind of mimetic developmental process. This creature in this drawing has both plant-like and animal-like components, thus the label “Plantimal”. The background is taken from a view of hills and mountains just south of Kitt Peak in Arizona.